No idea what's the name of this sculpture. I should have looked. But do you have the habit of reading physical newspapers? 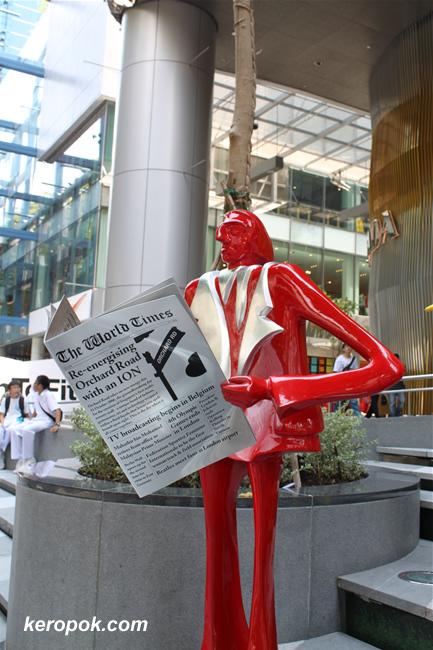 Or are you one of those who like to read e-papers? I read our local newspaper online cos I refuse to buy it as it is full of rubbish articles and bad journalism. Gives local papers a bad name! don't read the newspaper, i prefer checking it on g.flip or watchin the news on tv. btw, hpy d.pavali,does mr. keropok celebrates this day too? Old uncle like me read Newspaper everyday. you are the TV person eh? No, I don't celebrate Diwali. crisp paper, does that mean you don't like to read the papers which someone has read before? hehe.. Sponsored newspapers r available at the train stations. I picked both copies n read them on the train. Even hv time to solve the puzzels n sudoku's ! Weekend I trawl thru several countries looking at their e-news. Oh, I read Todayonline during my lunch - quite the news addict, arent I - hehe.